The Small Boy came home from school with a strange mark on his face today. 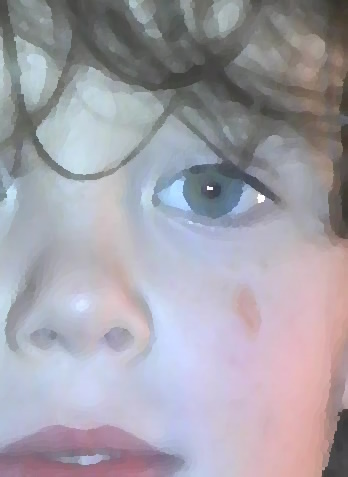 He comes home from school with strange marks on his face most days to be honest, but generally they turn out to be paint, glitter, pen or the remains of his packed lunch's yoghurt. Today's strange mark looked oddly like a burn; red and blistered but strangely elliptical. And, unless the teacher IS having a restorative fag mid-lesson to assuage the trauma of teaching 32 headstrong six-year-olds (and frankly I wouldn't blame her), it wasn't a burn. Anyway, he had been wounded, not just on the cheek, but in the heart. By A GIRL. The favourite-girl-in-the-whole-wide-schoolroom girl. A little, blond *rolls eyes* girl. This Little Girl asked The Small Boy to marry her. But, even though she is his favourite girl in the whole damn playground, The Small Boy (showing remarkable sense and maturity, I think) said he didn't want to marry her just yet. And then the Little Girl nipped his cheek. Really, really HARD. The Dinner Ladies sorting out the ensuing mess invoked Playground Punishment, first offence, and made The Small Boy Stand Against The Fence when OBVIOUSLY .. The Small Boy was heart-achingly baffled by such events and even more affronted that the Little Girl promptly went to ask The ArchEnemy to marry her instead..... AND he said yes. Great post... Bless him! My 4 yo came home and told me he had been told by another girl he was her boyfriend, followed by a huge sigh! After a "chat" with Dad he now says "I've got 2 girlfriends, ones a spare"